A perforated drum with specially designed vanes rotates at high speed. Oil mist is drawn into the unit and impacts on its vanes at high velocity. Special drum pads assist the coalescing process and filter out stray solid particles. Centrifugal force pushes oil to the unit’s outer case where it drains back to the machine for re-use or collection and clean air is returned to the workshop through the top of the unit. Since 1969, Filtermist Oil Mist Collectors have been designed to satisfy the demands of the manufacturing industry. Years of experience together with feedback from independent industry experts, have resulted in a number of advances that have improved efficiencies and performance. 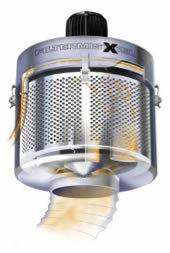 The latest Filtermist Oil Mist Collectors offers many design improvements over previous models. The units have a reduced size and weight. They feature curved vanes, which improve air flow and collection efficiency. They have a new entry cone, which optimizes air distribution. The drum/case gap has been reduced to minimize droplet fragmentation and improve filtration efficiency. The units feature split casing to allow for easy access to maintenance. Filtermist Oil Mist Collectors are also versatile. They can be used on lathes and machining centers, as well as grinding machines, industrial saws, parts washers and even in food processing applications. They are often small enough to be mounted directly onto machine tools, but can also be installed on floor stands, machine mounting brackets and wall brackets, or suspended from a factory ceiling. AMT Machine Tools has been carrying Filtermist Oil Mist Collectors and accessories in Canada for more than 35 years. 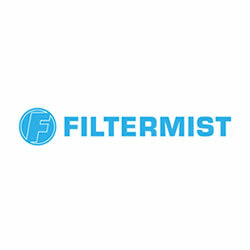 The Toronto-based company offers a large inventory of Filtermist products to companies across the country, and is always available to assist with installation and capacity recommendations.